Every person in this world deserves to feel important, appreciated and needed. That's the basic premise behind the founding of Link Associates back in 1953. As the largest community-based provider of services to adults and children with intellectual disabilities, including mental retardation and autism, Link is providing these people with opportunities to achieve their personal goals. To do that, however, takes a considerable amount of money. So, three years ago, this Des Moines-based nonprofit founded the Barley PAR-TEE. On the surface, it might sound like just another golf tournament and beer tasting. But look closer and you'll find the whole thing gets pretty twisted! For instance, it's not just any golf tournament. Upon inspection, you'll find those players are only using two golf clubs. The rest are… uh… tennis racquets? And croquet mallets? What's more, their golf balls have been replaced with tennis balls. Just try retaining your par three with that equipment to play with. The beer tasting is strictly provided by local microbreweries. No store-bought stuff here. And the BBQ is homegrown, too. 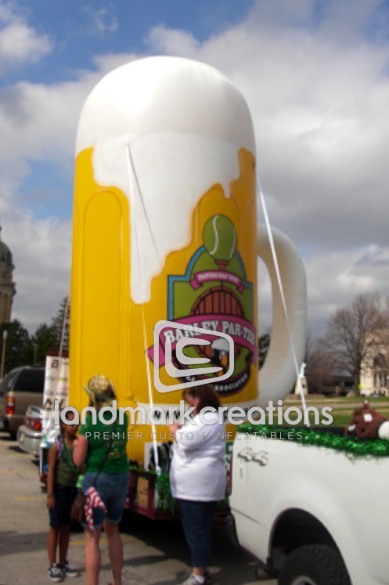 In an effort to draw more attention to this all-important annual affair, Link contacted Landmark Creations to commission a custom advertising inflatable. This 15-foot-high beer mug will make its debut at the third annual event. In the meantime, it's had preview showings at the local St. Patrick's Day parade and a street concert. We wish you much success with bringing in more supporters than ever before. We're sure your new inflatable product replica will provide the attention-getting twist you need.